Nothing is truly very permanent, is it? This summer has been such a mix for me. A mix of routine, attempts at accomplishment, much needed rest (as needed), and lots and lots of time with my birds, cats, and sometimes ill dogs. And lots, and lots of sad news and the deaths of four people close to good friends, and to me. I tend to punch holes in every moment of peacefulness, thinking there needs to be more going on than ever really needs to be, with a mind that has more ideas than time to explore them. Not getting to them all leaves me thinking that I am standing still most of the time, instead of seeing the baby steps of progression that are actually occurring. Last night I took the pups out for a walk. My neighbor's two energetic maltese girls, and my two elderly citizens. Tilly, sporting a new very short haircut, resembled a newborn pink mouse on a leash. With the hair gone I can see that he has lost weight. Almost frail to carry. His appetite for food and walks has diminished this summer, and I think his vision and hearing are fading or gone. No longer charging up Temple Street like a puppy, as he did just this past spring, he now walks a few tremulous steps and waits as if he needs to reorient himself with the new space he has found. I put him on a leash and he refuses to walk altogether, so I stand next to him and reassure him with little pats as he tries to navigate. He seems scared. I am too. Very. When still on leash we encountered a puddle and I gently tugged the leash to guide him around it. His legs gave out and he fell on his side. Leave it to say I scooped him up and was glad no one was around to see me get emotional about it. This is my baby. It might be time to use the nice stroller Auntie Valerie sent the kids. Thanks, Valerie. Tilly's potty habits are not usual, and he is having trouble "going" in the right places. Honestly though I don't really mind that after dealing with Toby for so many years. I've always joked that Tilly pees magical rainbows and it is true. Just the fact that he is still here and almost fifteen makes this true. We will cope. He spends most of his time sitting on a poofy bed, sleeping. He gets up a few times a day to drink, nibble, or pee, and then it is back to bed. Such is life for an oldie, I guess. Yet I hate to see it happen. It physically hurts. 99% of the time I am in denial but the reality is creeping in. Maybe because there have been so many wakes and funerals this summer that I feel like the veil between worlds is exceptionally thin? I don't know. Yesterday was a washout as I made the decision not to get all sweaty yucky and try to compensate for Thursday's cleaning. I did one Good Thing for my current art project, and had a BLAST doing it. 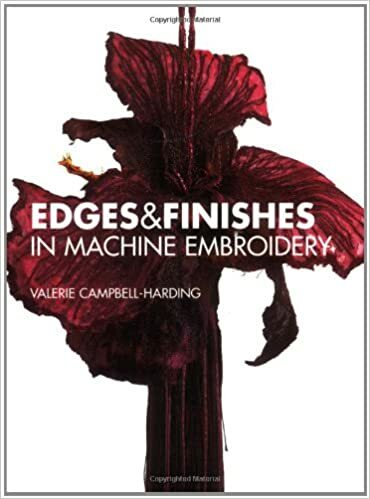 I dug into my library and found Valerie Campbell Harding's amazing book "Edges and Finishes in Machine Embroidery" to gain direction with the next step of the current piece. I expected to sit for a leisurely half hour and gently think, but in true Ropple fashion within a couple pages and five minutes my brain was off and running. Then it was zigzag all the way as I blended a neat braided yarn with a thin gold cord using variegated thread, and finally some metallic thread too. I made yardage of the stuff and know it will be wrapped and coiled, and beaded, to become a balanced part of the piece. As soon as the hands are working again. Grrrrr. It is so therapeutic to play with textural materials. I am so grateful to the amazing authors of all the books I hoard and treasure for carving such an eccentric path with their accomplishments. Even if yesterday was mostly a washout, I was able to make this and open a new door onto using handmade cords as embellishments and edges. Niiiiiice. Cheers. So, Here is a peek of the piece as it is now...cheers! Back to cleaning! Today we lay to rest a member of the Temple Street neighborhood for as long as I can remember (more than 50 years.) She passed away a week ago, and today we say our final goodbyes. My neighborhood is like a small English village, really, and in the years since I bought my parents' house and lived here full time "Mrs. C" and I had become friends. She was a compulsive vaccumer and her house was always so spotless I was in awe. She was a down to earth, say-it-like-she-sees-it kind of woman who was fiercely independent and more resistant to illness than any person I've ever met. When I was young, I was in and out of her house like one of her own kids as her daughter Lisa was one year older than me, and we were best friends. Lisa died in a tragic accident at the age of 16, and it was a long road back from emotional estrangement for all of us. I reminded her of Lisa, and she reminded me of Lisa, and there was pain. For the past decade tough, I'd see Mrs. C when walking the dogs, and on the occasions that she needed a little help. We put her dog to sleep together, and I cared for her pets when she faced many hospital stays in recent years. We laughed about things on the street and in the world, she showed me pictures of her grandchildren, and shared a great love of dogs. Her house, with the kitchen light on, looms iconic on the street and is full of childhood memories. While she has been hospitalized for some time and the house stood empty, it was waiting for her return. Now it seems cold and lonely. Death is so sad. Add to this another sudden death this week of the husband of a dear friend. I am ready to lock myself into my sewing room and sew for a month. Alone. Doesn't matter what I sew, I just need to distract myself. This summer has been tough -- losing Tobes, and then three significant deaths that have affected people I care about. Tilly being really ill, too. Am working on my artwork, but seems to be a lot of other things that need doing, too. As I write this, my little green feathered pickle is being exceptionally sweet on my shoulder, reminding me that I have to get going and feed the flock. With them around, I will never slack off completely, which is a good thing. RIP, Mrs. C. You are missed.